Paul before we talk about your work, perhaps you could introduce yourself and maybe give us a definition of bookbinding? 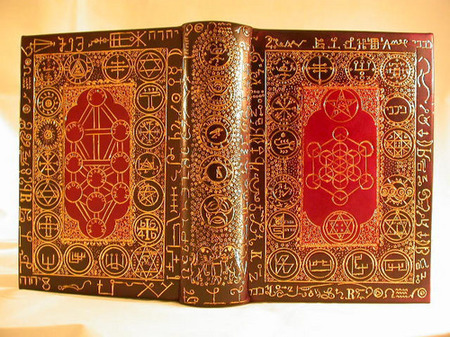 Paul Tronson – My name is Paul Tronson, I am a Master Book Binder who restores antiquarian and incunabula books to their original time period using traditional materials hand made to ancient formulae. The binding archival process can extend a book’s life for many decades, and is necessary in order to preserve books that sometimes are limited to a small handful of remaining copies worldwide. It is vitally urgent that such books are cared for in the most loving manner befitting the books’ rarity and subject matter”. The first step in saving and preserving a book, is found in it's deconstruction. The pages need to be separated from the covers and the stitching removed. This is done as delicately as possible, all restoration is done at this point, be it the removal of “foxing”, ink stains, page tears etc. Various secretive techniques are employed to repair the various types of page damage that might have occurred during the life of the book. On Paul’s website, there are many examples of how the repair of these pages is carried out. Great care is taken to make sure this process does not further damage the pages, before they are added to the various groups of page signatures, which when collated are beaten flat and pressed. This final preparation of the “foundations” of the book could mean the difference between a beautiful work of art, and a useless stack of paper and leather. The sections are then hand sewn in the style of its period into book form. Again, Care is taken to use the proper stitching of the period in which the book was made, which shows a level of love and commitment to his craft that is often not seen in today’s modern world, where the old ways have been forgotten long ago. The next step for Paul is the creation of the book cover, he uses hand-tanned, leather which is dyed using vegetable dyes, hand-marbled papers all of which he manufactures himself, and finally hand-tooled in gold-leaf. The design of the book cover involves the hand-tooling, where an extremely thin layer of gold is implemented to give the book a striking appearance. Such designs can be lettering, symbols, or magical sigils, depending on the nature of any particular project. “Bookbinding is the art of sewing loose pages into a cover to construct a finished book. Because the pages and book covers are often times hundreds of years old, the handling of these pages has to be undertaken with great care, and a delicate hand. Margaret Stead. What is the difference between normal bookbinding and royal bookbinding? Paul Tronson – That depends on what you consider “normal” bookbinding, you would be familiar with the 3 styles that are practiced today, namely Letterpress binding, Library binding and casework. I would consider “normal” book binding, the 70+ styles that existed before the Industrial Revolution, where everything was produced by hand, these are styles that I practice today including Royal bindings which are highly elaborate and were usually reserved for royalty or nobility who employed the finest Master binders of their era. Margaret Stead. How did you first become interested in bookbinding as a career. At an early age during my apprenticeship, I considered modern binding totally unsuitable for rare books, and decided to research the different styles, materials and techniques used over the past 1000 years, not an easy task as there is very little literature on the subject, but I found that I could breakdown, analyse and re-construct using the same principles and techniques and skills of the original. At a later date I realised that the modern materials I was working with were unsuitable and decided to make my own, which meant vegetable tanning my own leather, hand marbling the papers to specific designs, making the vegetable dyes for the leather, the glues, pastes, waxes etc. Exactly to period formulae, it was then that I began to understand the Alchemical principles behind ancient bookbinding techniques i.e., mineral and vegetable properties, herb roots, earth boles and pigments. Margaret Stead What are your credentials Paul? How long have you been doing this work? Paul Tronson Thirty years…man and boy… I started my business 20 years ago. I served a six-year apprenticeship and a two-year Master’s degree and am qualified in 10th century upwards in incunabula/antiquarian bookbinding, restoration and conservation. Margaret Stead – What sort of equipment do you need to create your books? Paul Tronson – I have a large collection of hand tools dating between the 16th and 19th centuries including small patterned hand tools, patterned fillet and farthing wheels for gilding patterns around the edges of the book, a large selection of pallets (straight lines), gauges (curved tools), hand letters, several nipping presses (for pressing the book), gold blocking presses (for hand set type) a 19th century lever guillotine, and much more. Margaret Stead – Your website says that you can be commissioned for individual projects. What sorts of projects have people have you been doing for people? Paul Tronson – I have a worldwide clientele who send me real treasures, I have recently finished a very rare book in English Mitre (that is two languages, one page English, one page Hebrew), which has been received back in New Jersey, every page demanded attention for various stains such as ink, damp, mildew or “foxing” not to mention torn pages and missing corners. I am currently working on a rare religious book for a collector in New York and one for Trinity College, Dublin. There are also the large family bibles and general literature people either send me or bring in personally, customers work needs to be booked in early as I generally have quite a long waiting list. I have around 500 hits a week on my website and lots of email enquiries. Margaret Stead – How many hours go into your producing a book, such as the examples shown on your website? Paul Tronson – That is one of those “how long is a piece of string” questions; it all depends on how much restoration is involved and what style of binding is called for. The book may have missing pages which means I have to research the book and find the pages, print them on matching paper and age them to match. Each project is different and time consuming, even for short run limited editions I still have to make the materials. Margaret Stead – What is the longest and shortest amount of time you have spent on various bookbinding projects? Paul Tronson – I have made a to clamshell box in a few hours and spent 12 months on one single project. Margaret Stead - Could you describe the various leather-working skills required to produce such beautiful results? Paul Tronson – Preparation is very important, knowledge of the different types of leather, grain direction, surface types etc… all contribute to the finished look. As all my skins are hand tanned, they are a natural colour, so the book is bound in say a plain white calf/goat and the vegetable dyes are added after. This is an example of a 16th century formula I use before paste washes were developed. First I choose a skin and look for any imperfections such as briar marks, scars, scratches, holes etc. The piece required is cut over size to allow for shrinkage when hot ironing, this done the skin is cut to the size of the book allowing for turn-in all round. The skin is then “pared” on all edges and “bordered”, this is a rolling action between the hands that moves the fat around the skin and makes it supple. After the book is covered the colours are applied. If gilding is required to the covers, the book is “glaired” (egg albumen) as a whole, if blind tooling is required, a mix of bulls fat and candle wax (tallow) is applied to stop the hot tools burning into the leather and to give a dark burnished look to the tooling, this is removed before polishing with a hot iron and carnauba wax. Margaret Stead –How long does it take to gild the book? Paul Tronson – Gilding is a specific art in itself and demands a keen eye, a steady hand and total concentration as there is only one chance with no room for errors, a mistake can be fatal causing the book to be stripped down and bound again, the principle rules of temperature, depth and dwell should be applied at all times. In short there is a preparation time, the white of an egg with a few additions is beaten to a froth and left to stand for an hour, the gold leaf is one 250,000th of an inch thick so with the slightest draught it will be lost. The tools you are using are heated and cooled to the correct temperature, the design you are creating is first “blind” tooled direct to the book and the egg white or “glair” is carefully painted into the relief, this in turn is left to dry for an hour. The gold leaf is cut with a gold knife, a hand made piece of paper is electrified by rubbing under my unshaven chin causing static, this will lift the gold allowing it to be laid into position. The tools are then heated and cooled to the correct temperature, too hot and it will burn through the gold leaf, too cool and the gold won’t apply. Working blind you need to find the exact position of the previous impression, slightly off you will get 2 impressions one blind one gold, some old binders liked to wipe a little Vaseline over the tool to pick up the gold and work it in but if the tool is too hot the oils will tarnish the gold. Gilding the edges of a book is just as complicated as you need to use earth pigments such as Armenian Bole, black lead etc. Well you did ask! Margaret Stead – What is the most difficult step in creating a book? Paul Tronson – I’m afraid I never seem to get any easy jobs, to give two extremes in paradox I’ve restored 12th century illuminated Psalters that were found submerged under water for 50 years in a crypt, and a rare 14th century book charred to a block of wood in a blazing inferno. Margaret Stead – Do you collect any rare books? Paul Tronson – I have an antiquarian bookshop above my workshop full of wonderful rare books, the prize must be a first edition Don Quixote, another is a John Minshew variant copy of Annals of Princess Elizabeth I 1635 by William Camden who was given access to all the secret papers of her secretary Cecil Burghley, this is one of only two known existing copies. I also possess a 1614 first edition, first issue of Sir Walter Raleigh’s ‘History of the World’ that was written by him in prison. This edition was suppressed and seized by James I of England (James VI of Scotland) who wrote to all the Bishops in Europe and told them exactly what he would do to them if they did not burn every copy, only a handful are thought to exist.